I am officially back from the land of cotton, and the beery adventures were abound. Not the least of which was catching a Myrtle Beach Pelicans baseball game, whilst sipping on a Pelican Summer Tide Ale, made with hops grown at the ballpark. That takes the marriage of beer and America's past time to a whole new level. South Carolina—and the southeastern U.S. in general—is embracing beer. The ball park is just one example of that. Breweries are popping up across the state and the old southern stand-bys and NASCAR favs of Bud, Miller and Coors are increasingly having to share space in tap towers with New Belgium and Bells. 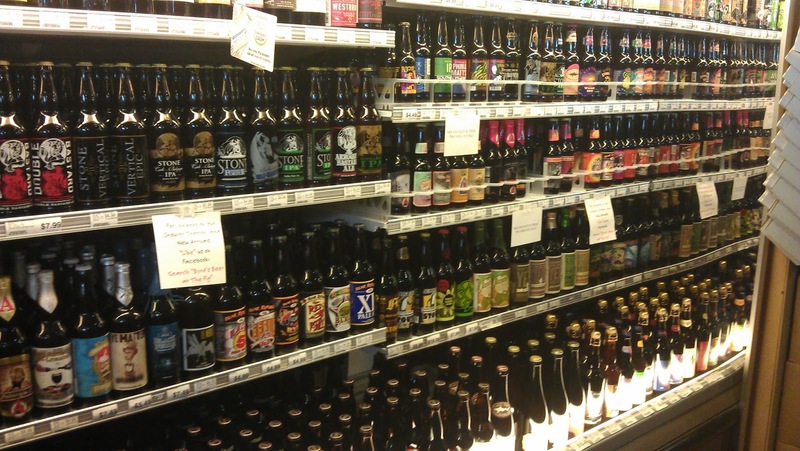 All five of the large supermarket chains in Myrtle Beach—Food Lion, Bi-Lo, Krogers, Lowes Foods and Piggly Wiggly—offer a diverse selection of both macro and micro brews—the later two also have a make-your-own-six-pack options. Gas stations are also jumping on the craft beer bandwagon as well. Craft beer is making inroads in South Carolina. at the Market Commons Piggly Wiggly. All in a place where you can also buy baloney and band-aides. I'm a big fan of the make-your-own option. In fact, that's how I buy most of my beer nowadays, so I was glad to see it at not one, but two of the grocery chains in Myrtle Beach. I did notice something that was a little disturbing, though. None of the beers I've mentioned are made in South Carolina. This is not to say that these places didn't sell South Carolina beer, they do, just not by the single bottle. South Carolina has five breweries that bottle or can their brew—RJ Rockers, New South, Thomas Creek, Westbrook and Coast—and yet New York was better represented in the single bottle, 12 ounce or 22 ounce offerings. Up here, in Albany, Price Chopper—where I do my grocery shopping—offers beer from eight New York State breweries in 12 ounce single bottles, and four more in the larger size. At Lowes Foods in Surfside Beach, Michelob Ultra and Miller 64 are offered in singles bottles, but not any of the local breweries. What's the point of that? Mixing a six pack of those two beers would be three dollars more than just buying a six of one or the other. I don't get the exclusion of the locals. Perhaps I'm unique in my perspective, but I like trying local beer, and being able to make a sixer is perfect for that. Since Myrtle Beach gets a million visitors a week between June and September, wouldn't it make sense to push the local product rather than Dog Fish Head or Fantome? I can get Brooklyn Local 1 in Albany, but I can't get White Thai from South Carolina's Westbrook Brewing Company. Price Chopper will have Stone Ruination, but they won't have New South stuff. In an even more unusual twist, Piggly Wiggly contracts Thomas Creek to brew their own brand of craft beer Pig Swig—an Amber Ale and a Pilsner—but neither of those beers were available as single bottles, either.